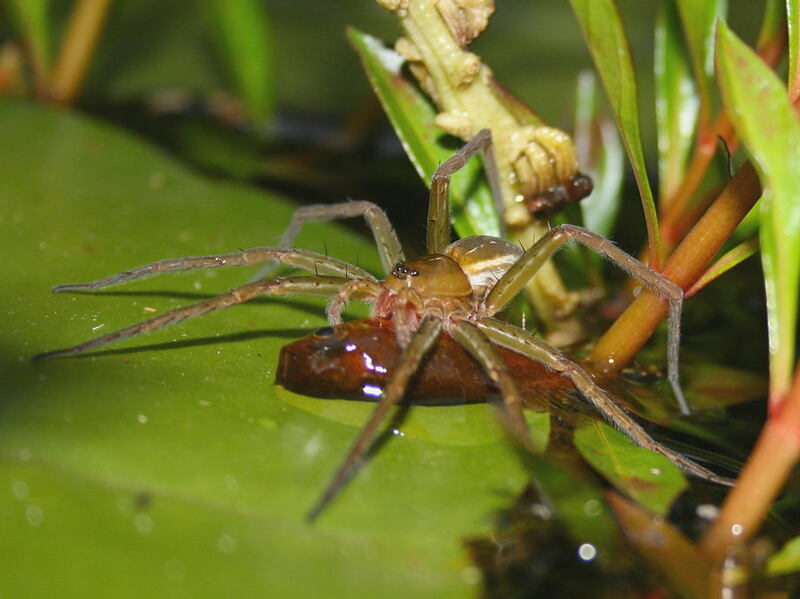 This page contains pictures and information about Water Spiders that we found in the Brisbane area, Queensland, Australia. Image thanks to Peter Liley, Sunshine Coast. The spiders in this family live at water edge of creeks and ponds. 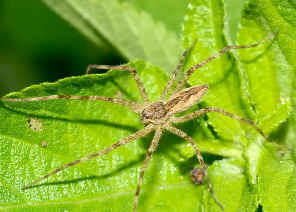 They are sometimes called Nursery Web or Fishing Spiders. They can run across water surface and dive under water after prey, including small fish. 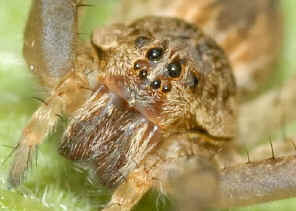 They may look like Wolf Spiders, actually they are close relatives. 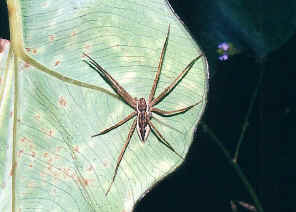 Water Spiders have eight eyes on their head in two rows of four and about the same size. 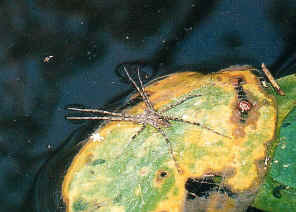 Water Spiders are sometimes seen putting some of their legs on the water surface. 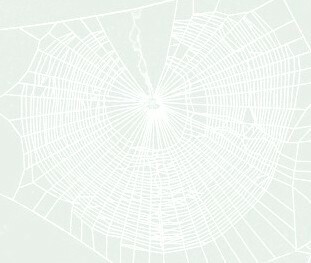 We believed they were sensing if there is any prey passing by, just like the Web Building Spider sensing prey on their web. This Water Spider easily found near the still water along Bulimba Creek. There were many of them there look similar in body shape but with slightly different in markings on body. More information and pictures please click on here. 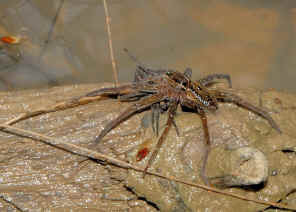 We sometime find this Water Spiders running across the running stream. Most of the time they are hiding among the plants at the water edge. The spider is brown in colour with white lines along each side of its body. Check this page for more information. 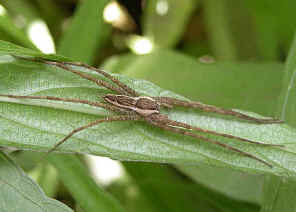 The Fishing Spiders have long and strong legs, all about the same length. 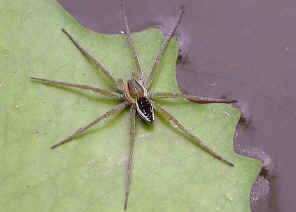 They usually seen resting on water edge with some legs touching the water surface. 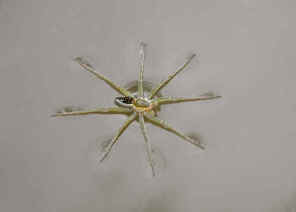 They move freely on water surface, and sometimes submerge to catch small fish, tadpoles and water insects. We have more information in this page. 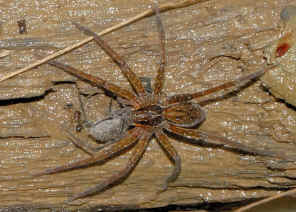 We found this Fishing Spider in Anstead Forest on Oct 2009. It was feeding on a huntsman spider. Please also check this page. 1. A Guide to Australian Spiders - Densey Clyne, Melbourne, Nelson 1969, p45. 2. Spiders - family Pisauridae - lifeunseen.com, Insects and Spiders of Sunshine Coast, Southeast Queensland, Australia, by Nick Monaghan. Last updated: October 14, 2009.